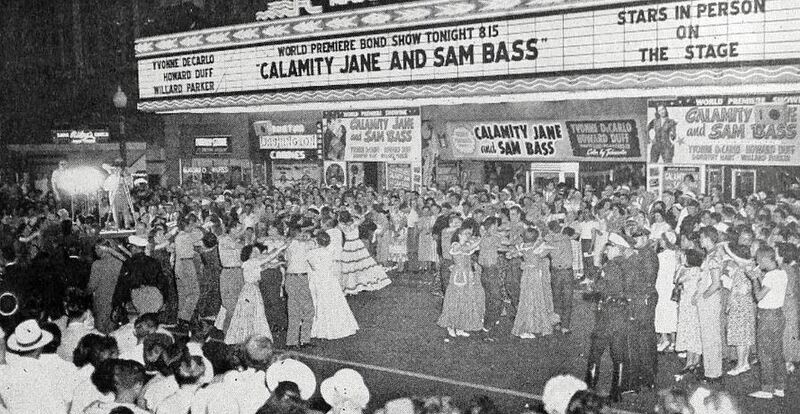 The photo above appeared in a show-biz trade publication showing part of the festivities which swirled around the world premiere of the movie “Calamity Jane and Sam Bass” starring Yvonne DeCarlo and Howard Duff at the Majestic Theatre on June 8, 1949. Several of the film’s stars made personal appearances and were made honorary deputies by Sheriff Bill Decker, sworn in by Judge Lew Sterrett (yes, Lily Munster was an honorary Dallas deputy sheriff!). There was a parade, a live show performed by the actors on the Majestic’s stage before the movie, a block party, and square dancing in Elm Street, with music provided by the Big D Jamboree band. 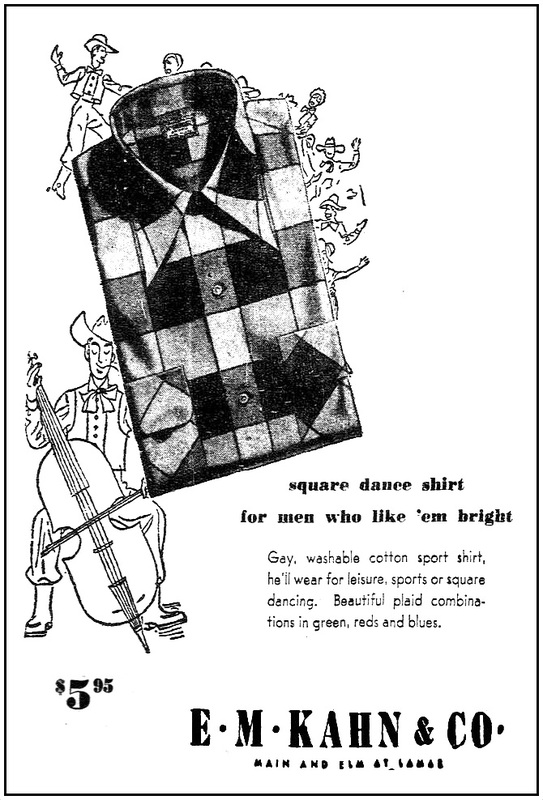 In 1949, as unlikely as it seems, square dancing was a HUGE fad which swept the country (or at least the Southwest). 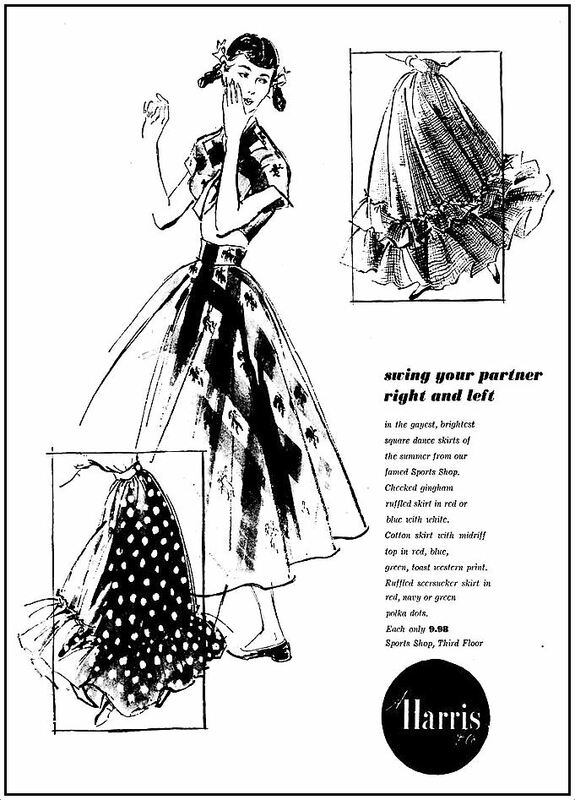 The peak years of the retro craze were probably 1948 to 1950, and its impact was pretty big locally, not only on the dance floor, but also in the fashion pages. 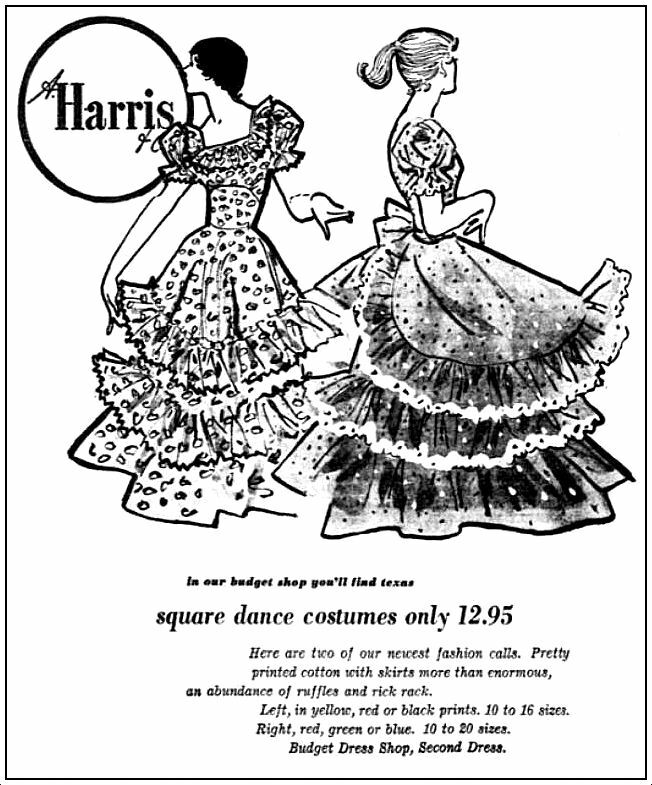 When you see every major Dallas department store — even Neiman’s — selling calico and gingham square dance fashions … well, it’s big. 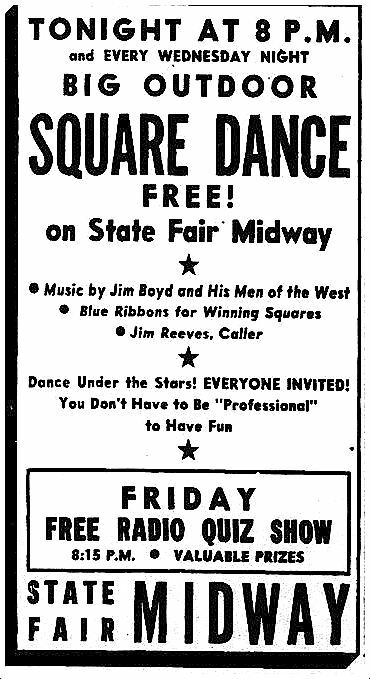 Not only were there lessons available everywhere, but there were clubs and weekly events all over town — every Wednesday in the summer of 1949, there was a big outdoor square dance held at the Fair Park Midway, with music courtesy of local celeb Jim Boyd. I’m not sure when it stopped (…I’m assuming it has…), but for decades, a lot of us participated in square dancing as part of gym class in elementary school. This interesting throw-back take on physical fitness seems to have begun around 1950 or ’51. 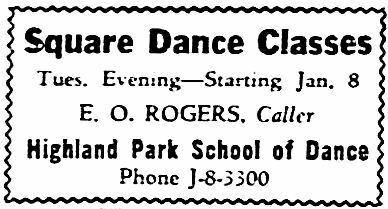 Not everyone was thrilled about this odd-but-charming grade-school rite of passage — some ultra-conservative communities complained, but the wholesome and old-timey dancing won out and became a standard part of Texas schools’ physical education curriculum. 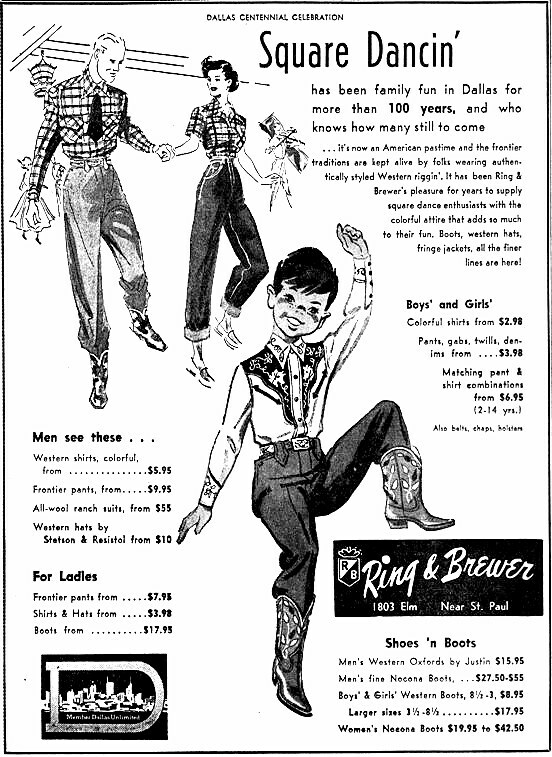 Forget young people’s cotillions — most Texas children had their first experience dancing with a partner to the strain of a cowboy fiddle and a voice telling us to “allemande left” and “do-si-do.” And I’m sure we’re all better for it. 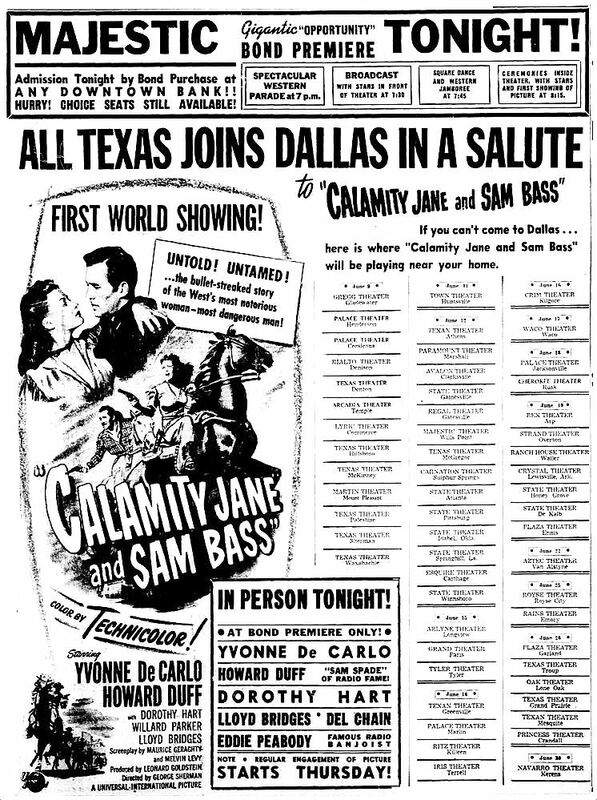 Premiere of “Calamity Jane and Sam Bass” was held at the Majestic Theatre on June 8, 1949, and it seems to have been a pretty big deal. There was newsreel footage filmed that night — wonder if it’s floating around anywhere? 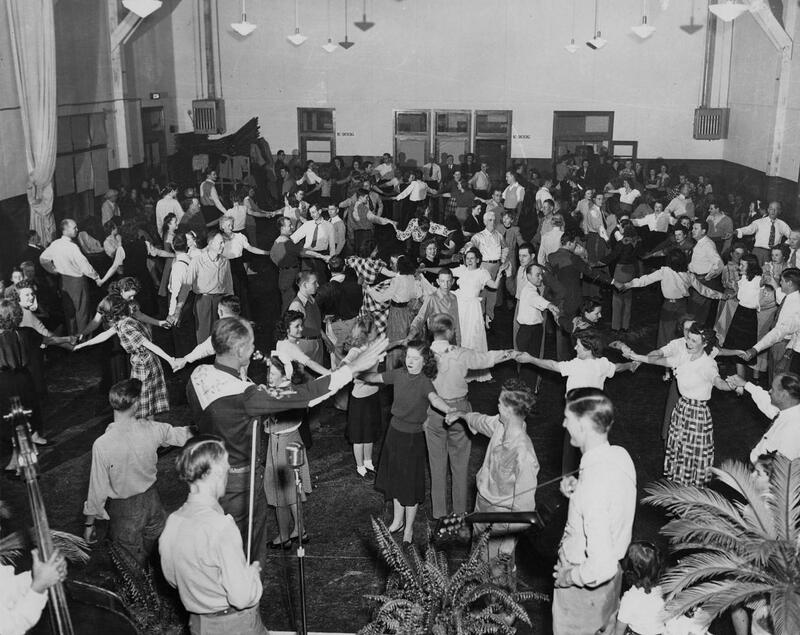 Photo of the square dance taken at La Reunion Place is by Squire Haskins and is from the Dallas Municipal Archives; is can be seen on UNT’s Portal to Texas History site, here. 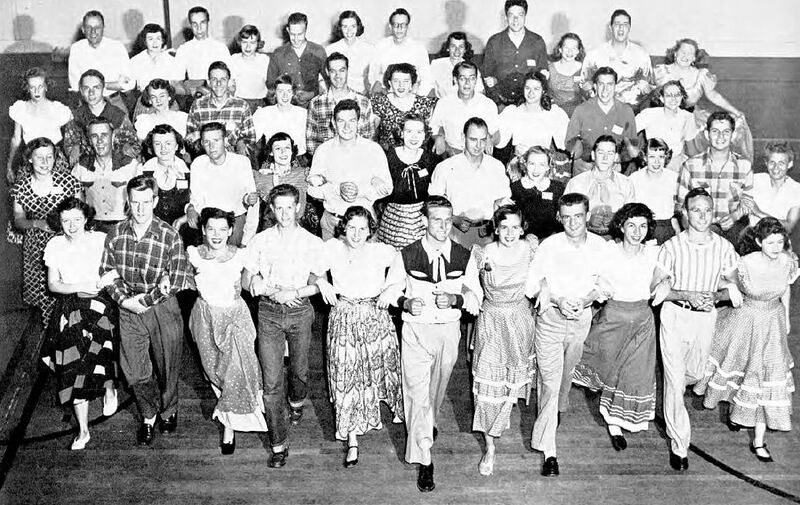 Photo of the SMU Promenaders square- and folk-dancing group is from the 1951 Rotunda, the yearbook of Southern Methodist University. Jim Boyd was a country-western singer who appeared in a few Hollywood films and was a Dallas disc jockey for many years. He also appeared around town often as a performer and personality. 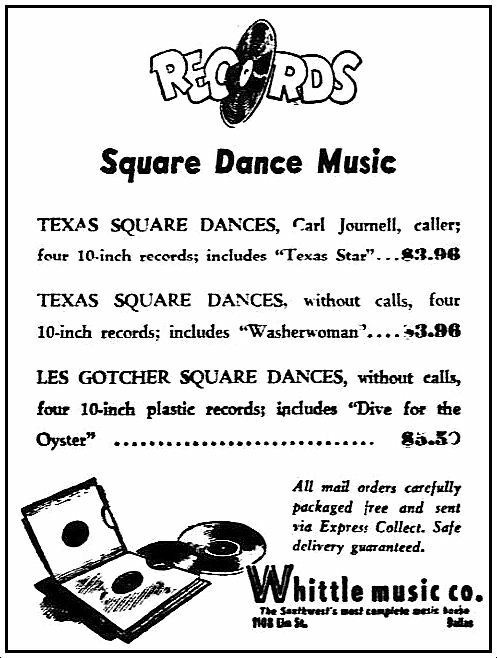 Dallas filmmaker Hugh V. Jamieson, Jr. and director Milton M. Agins made a short film called “Saturday Night Square Dance” (made in either 1949 or 1950); it features Boyd and his Men of the West band, plus square dance groups Silver Spur Square Set and Thompson Square Dance Club. I can find nothing on the two groups, but it seems likely that this film was made in Dallas. The quality of the film uploaded to YouTube is not very good, but, who knows — you might see your parents or grandparents in there if they were big square dancers! You can watch it here. 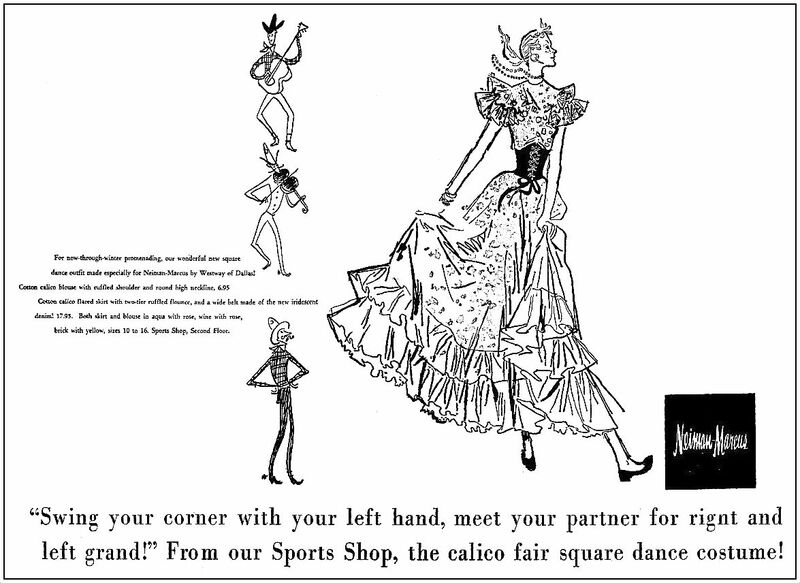 Square Dancing has sadly become almost a forgotten art. 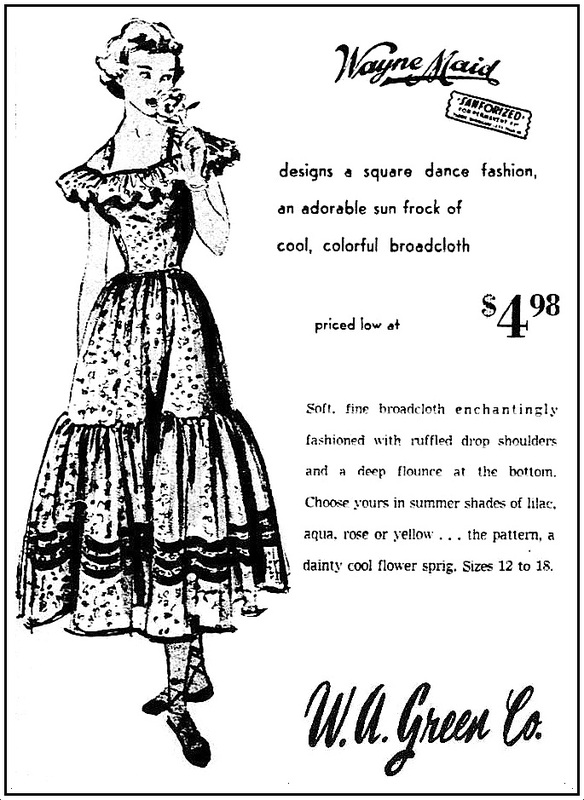 Attached is an episode from, “Father Knows Best,” with Barbara Eden at a Square Dance. this is GREAT !! terrific research. 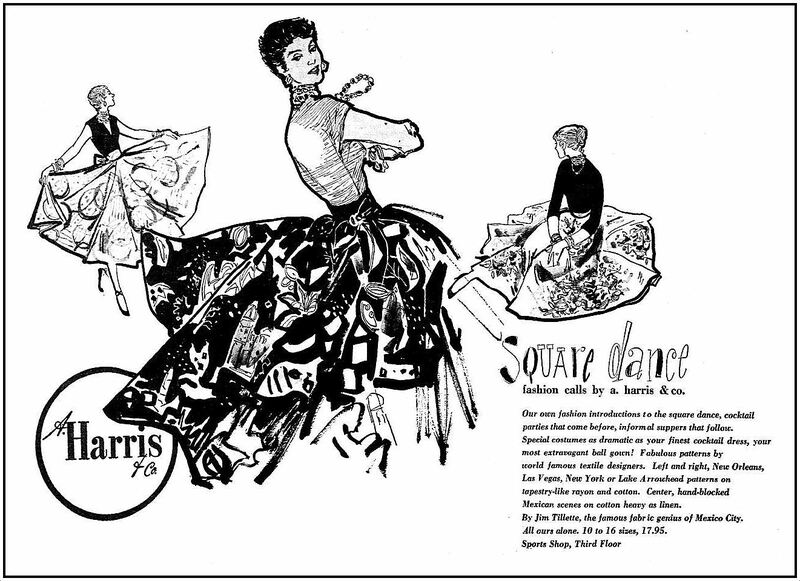 i had NO idea square dancing such a big deal and the demographics are very surprising. i would like to point out, that not only is the n-m attire more stylish, it was made in dallas AND comparable or less in price to the other stores. 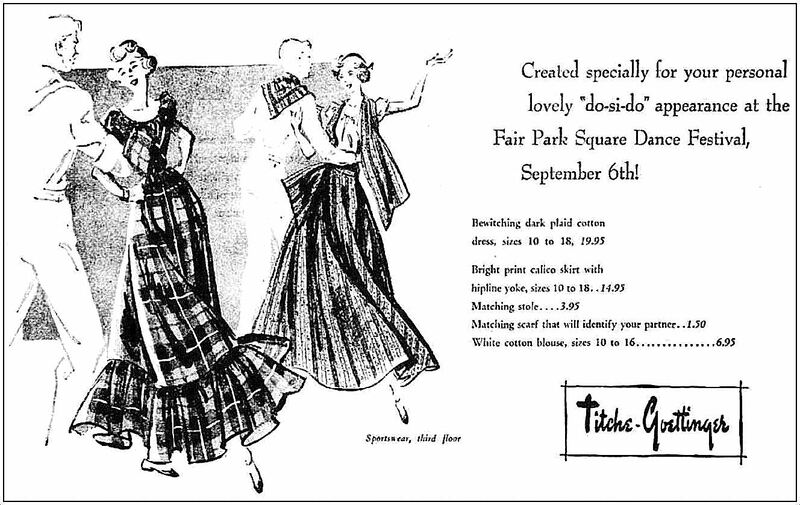 and how wonderful to see those now long gone store names…i mean neiman’s was always my first choice, but titche’s was an excellent store, too. ms bosse, you are a dallas treasure. Enjoyed this! Brought back memories of square dancing in elementary school. I had forgotten all about it. Loved seeing the ads. 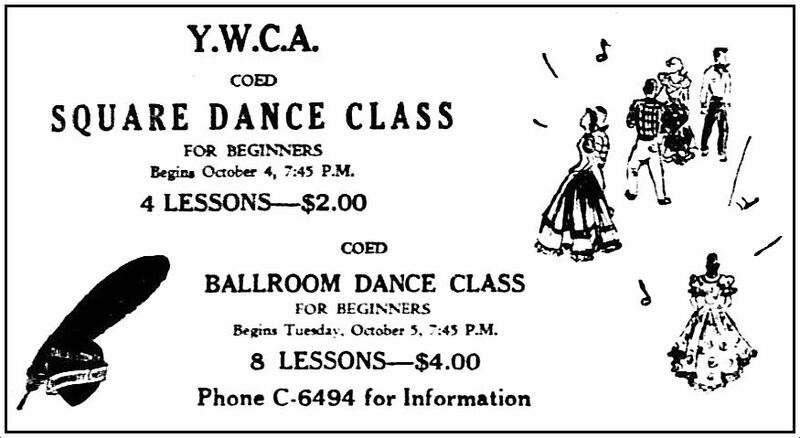 Square dancing was still pretty popular well into the 60’s in certain circles. My grandparents taught it even as late as the 70’s and 80’s, and had a ballroom addition added to their house for lessons and parties! I still have my grandmother’s square dancing record player/PA system. I haven’t anything really useful to add on square dancing but do have a clear recollection of the movie. In early June 1949 after completing the third grade I was invited by my grandparents to spend a few days with them in Grayson County. Several days into the visit we learned that at flash flood had struck Garland, dumping close to foot of rain in less than two hours on the night of June 13 and claiming several lives. Our house was, like several along Duck Creek, filled with four feet of water and rendered uninhabitable in the near term. Since I would have been of little help to my parents in putting things in order my grandparents suggested I spend some more time with them. 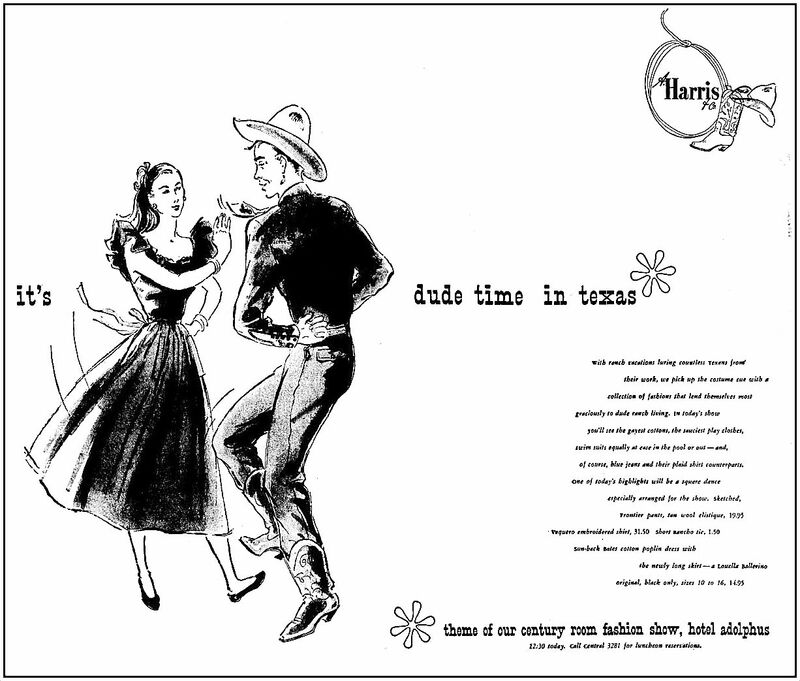 Evidently I stayed at least as late as the 22nd of June (see ad above) as I clearly remember my grandfather and I attending Calamity Jane and Sam Bass at the Aztec in Van Alstyne. It was one of those movies of the type my grandfather liked to say contained “no natural deaths” and I’m sure provided enough excitement for the both of us.